The incredible, little-known story of the U.S.S. Triton is told in the new one-hour documentary Triton: America’s Deep Secret. Once the largest submarine in the world, the Triton was built, launched and commissioned in Connecticut, and much of Triton: America’s Deep Secret was filmed in the Nutmeg State! The film premiered on CPTV on Thursday, November 1, 2018 at 8 p.m., and will encore on Sunday, November 4 at 6 p.m. and Monday, November 5 at 10 p.m. on CPTV, and on Wednesday, November 7 at 8 p.m. on CPTV Spirit. In the midst of the Cold War, the Eisenhower administration launched a plan for demonstrating American military and technological superiority: Send a nuclear submarine around the world – submerged the entire time – and remain undetected until completing the journey. Enter the U.S.S. Triton, then a brand-new submarine, and the world’s largest. The Triton’s mission was classified, so secret it was kept from most of the Navy and the Triton’s own crew. Luckily, the crew had an experienced and even famous captain to lead them: Capt. Edward L. Beach, Jr., a decorated veteran of Pacific battles in World War II and the author of several books, including Run Silent, Run Deep. From left: Kevin Finch, director and producer of Triton: America’s Deep Secret; Commander Al Steele, USN (ret. ); and Lt. Commander Ben Amdur, then the officer-in-charge of the Submarine Force Museum in Groton, Connecticut. 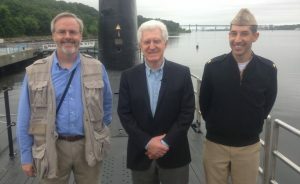 They are pictured on the deck of the historic ship Nautilus, the very first nuclear submarine. Commander Steele played a pivotal role when the U.S.S. Triton ran into trouble during its round-the-world voyage. Both the Steele and the Triton are featured in Triton: America’s Deep Secret. The Triton sailed down the Thames River into the Atlantic in February of 1960. The crew did not know where they were going; Beach didn’t announce their mission until after the sub dived into the ocean. He then told them they would go around the world, following Magellan’s old route. However, less than two weeks into the journey, crises arose — including the failure of a vital piece of equipment; an ill crew member who had to be evacuated from the vessel; and a near-collision with a submerged mountain in the Atlantic. After much hard work and many trials, the captain and crew were finally ready to celebrate reaching the end of the journey – and then trouble struck again. Triton: America’s Deep Secret reveals how the mission ended, and why most Americans don’t know the story of this brave crew and record-breaking submarine. The film features interviews with members of the crew, the widow of the Triton’s captain, an employee of submarine builder Electric Boat who was present for Triton’s launch, and more!